GM is planning to use 100% wind power to manufacture SUVs in its Arlington, Texas, plant. The company is on track to meet its goal to power all plant operations with renewable energy sources by 2050. 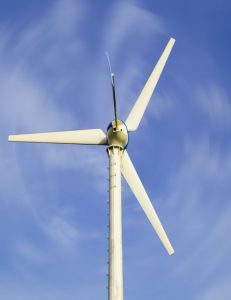 Besides cost savings, the use of renewable energy sources will position GM as a green company ahead of its competitors. This post is based on the ThomasNet.com post, GM Will Produce SUVs in TX Using Only Wind Power, and the video GM will power its SUV plant with wind, both by Anna Wells, October 23, 2018. Image source: nachai © 123RF.com. 1. How does GM go about meeting its goal to power all plant operations with renewable energy sources? Guidance: GM currently sources its wind power from the Cactus Flats Wind Farm in Eden, TX, to run all plant operations in its Arlington, TX, plant. The wind farm also supplies some of the energy for its other Texas locations. GM is planning to reach the remaining 80% of its renewable energy goal by relying on wind and solar as the only energy sources. 2. What are the operational advantages of being a “green” company for GM? Guidance: The use of renewable energy sources brings GM an annual savings of $73 million. The price of renewable energy sources is also more stable and lower than traditional sources. In addition, GM is ahead of its competitors in going “green” and thus becomes a leader in environmental sustainability.